There are 24 Assisted Living Facilities in the Mechanicsburg area, with 7 in Mechanicsburg and 17 nearby. The average cost of assisted living in Mechanicsburg is $3,495 per month. This is higher than the national median of $3,346. Cheaper nearby regions include Dillsburg with an average starting cost of $3,120. To help you with your search, browse the 120 reviews below for assisted living facilities in Mechanicsburg. On average, consumers rate assisted living in Mechanicsburg 3.9 out of 5 stars. Better rated regions include Camp Hill with an average rating of 4.1 out of 5 stars. Caring.com has helped thousands of families find high-quality senior care. To speak with one of our Family Advisors about assisted living options and costs in Mechanicsburg, call (855) 863-8283. The small town of Mechanicsburg rests in the Cumberland Valley region of Pennsylvania. The Allegheny Mountains and Blue Ridge Mountains create a beautiful natural border for the area that deflects the bitter winter weather for the city. The breathtaking scenery and outdoor recreational opportunities of the area are perfect day trip options for seniors residing in assisted living communities. The Pennsylvania Department of Aging licenses two types of assisted living residences. ARLs are divided based on the services offered by the facility and the kind of housing units that are provided. Seniors seeking an assisted living facility in the area will find 64 to choose from, including seven in the Mechanicsburg. Mechanicsburg is spared the harsh climate experienced in areas to the north and west of city. The Allegheny Mountains shield seniors living in Mechanicsburg, so they enjoy a milder winter than those living just 100 miles away. Summers are warm, with a July high temperature around 85 degrees. One of the benefits for seniors residing in Mechanicsburg is the low crime rate. Violent crime in the city is lower by 8.9 than the national average and also lower than the Pennsylvania average by 4.8. The city has a property crime rate of 37, which is also lower than that of the nation and state. Mechanicsburg seniors pay about the same sales and income tax rates as those living in most American cities. However, Pennsylvania offers its residents additional benefits. The state exempts all income from Social Security, 401(k)s, and IRAs from taxation, and pension income is also exempt for those age 60 and older. The Mechanicsburg cost of living index is lower than both the state and national averages. Seniors pay around seven percent lower health care rates in the city. The Mechanicsburg area is home to world-class medical facilities, including UPMC Pinnacle West Shore Hospital, in the event of medical emergencies or illness. Mechanicsburg has an array of community resources for seniors, including Messiah Lifeways, an organization that offers a diverse selection of activities to keep adults over 55 active and independent, as well as a downtown senior center. Assisted Living costs in Mechanicsburg start around $3,495 per month on average, while the nationwide average cost of assisted living is $4,000 per month, according to the latest figures from Genworth’s Cost of Care Survey. It’s important to note that assisted living rates in Mechanicsburg and the surrounding suburbs can vary widely based on factors such as location, the level of care needed, apartment size and the types of amenities offered at each community. 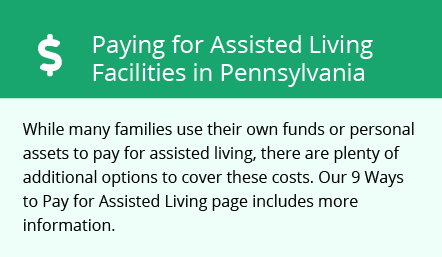 The state of Pennsylvania does not pay for services received in assisted living facilities, neither through the Medicaid State Plan nor any waiver program. However, the state does add to Supplemental Social Security Income (SSI) for those who qualify. Mechanicsburg and the surrounding area are home to numerous government agencies and non-profit organizations offering help for seniors searching for or currently residing in an assisted living community. These organizations can also provide assistance in a number of other eldercare services such as geriatric care management, elder law advice, estate planning, finding home care and health and wellness programs. To see a list of free assisted living resources in Mechanicsburg, please visit our Assisted Living in Pennsylvania page. Mechanicsburg-area assisted living communities must adhere to the comprehensive set of state laws and regulations that all assisted living communities in Pennsylvania are required to follow. Visit our Assisted Living in Pennsylvania page for more information about these laws.